1 of 3 Heat oil in a medium-size nonstick saucepan over medium-high heat. Cook garlic 30 seconds, then stir in onion, oregano and 1/4 teaspoon salt; cook 4 minutes. 2 of 3 Stir in couscous and cook for 1 minute. Add chicken broth and 1 cup water to pot and bring to a boil; reduce heat to medium-low and cook, covered, for 12 minutes or until water is absorbed. Add green beans to pot for last 5 minutes of cook time. 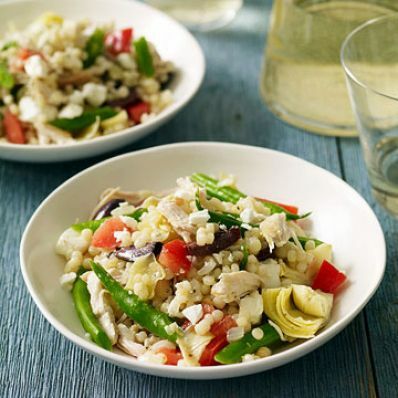 3 of 3 Stir in remaining 1/4 teaspoon salt, chicken, tomatoes, artichoke hearts, feta, olives and lemon juice and serve immediately. Per Serving: 2 g sat. fat, 6 g fiber, 6 g Fat, total, 42 g carb., 19 mg chol., 968 mg sodium, 16 g pro., 280 kcal cal.